An ideal gift for family and friends, this 'Basket of Hearts' contains our premium soaps in the shape of hearts which are not just appealing to look but also cleanse while nourishing the skin. Practically any fancy shape can be given. 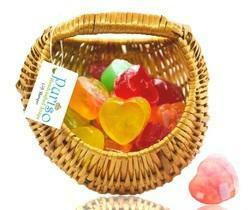 Dies available at present are Mango, Teddy, Apple, Strawberry, Fish, Leaf, Shell, Pear, Lemon, etc. 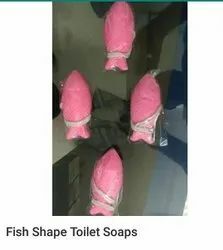 These soaps can be put on a rope also if required. Water Melon Soap is a handcrafted artisan soap gives a highly refershing bath with exotic Fruity fragrance. Soap with a rope (Hanging soaps) available in various shapes like Fish, Heart, Teddy bear etc. Special Soaps in Fancy shapes with Exotic fragrances of Rose, Jasmine, Lavender, Sandal & Lemon. We manufacture Attractive Flower Soaps with Olive oil & exotic fragrances such as Jasmine, Rose, Lavender, Lemon, & Sandalwood. We are the best manufacture of colorful soap. Lovely gift for Baby Shower.